If you live long enough, there will be a point where God takes away something that you really love and enjoy. This could be a job, a position, a relationship, a dream or even a long time friendship. Just the thought of this can be scary, but there is no way around it. Regardless of how much you love God, things you don’t like will happen. And when loss occurs, it is very easy to become confused and sad. I can talk about this because I was in this place just over a year ago. I was 22, one year away from college graduation, in what I thought would be my last relationship ever and loving life. But shortly after the one year point, God revealed to us that He wanted our relationship to end. When it happened, I was quietly devastated. I had never experienced being so attached to something and then having it removed from under me. But now that I look back at the situation, I realize that God was working in every single detail. I want to share some of what I learned from my experience with loss and how to make it through that season. 1. God is sovereign. If He allowed it, there is a great reason for it. Trusting God is not always easy. It can be downright painful. Seeing something that you loved leave is hard, but there is a point that we have to get to as believers where we decide to trust Him regardless of how we feel. Your faith in God’s plan for you cannot be controlled by your emotions. If it is, you’ll be fickle and you’ll never stand firm. We have to understand that if God allows something to happen, He knew that you could handle it. Nothing that happens to us catches Him off guard, so you have to know that you know that you know that you know that He will help you through it, that He is good and that He is for you. 2. It may not have aligned with His purpose for your life. There are some ventures and undertakings that we jump into that may benefit us for a time, but that may not align with God’s long-term purpose and vision for our lives. We get comfortable in places when God is trying to move us to where He needs us to be. Maybe God removed it because it wouldn’t have allowed you to reach your fullest potential for Him. 3. He may be saving your from future issues or hurt. Anytime I think about loss, I remember a testimony a church member shared once. He was serving in the military in Kuwait, and he had been praying that he would be able to return to his family soon. When the day for his scheduled return came, his officers pushed it back and told him that he wouldn’t be leaving yet. He was sad and really disappointed that he wouldn’t be back home when he thought he would be. But shortly thereafter, he was awakened with news that the plane that he wanted to be on had gone down and that people had lost their lives. Sometimes, God is literally blocking issues, pain, hurt or further loss from us by saying “no” right now. 4. He may be removing an idol from you to get closer to you. I have learned a lot about idols through this experience, so much so that I blogged about it. I’ve realized that God hates them. He will smash them into a billion pieces if you place them where He should be. When I look back, I realize that I had placed the relationship on the altar of my praise, where God should have been. I spent most of my free time with the guy and made no personal time for loving God. The time that I had prior to the relationship quickly vanished. Although I would have said that I was living for God and many people regarded me as an outspoken Christian, God was not the object of my affections. I would have never said that I worshiped my relationship, but my actions said it for me. God is a jealous God. He will not allow us to hold onto those things that keep us from Him, because He loves us that much. God never meant for us to struggle through issues alone. Galatians 6:2 NKJV says, “Bear one another’s burdens, and so fulfill the law of Christ.” God created us to be relational people who thrive when in community. We need each other. When you suffer loss, reach out to 2 or 3 people that you can trust who will pour into you, keep your eyes stayed on Christ and just love you sacrificially. The healing process starts when you share what you’re going through. Holding things in doesn’t help. Don’t let pride or shame keep you from getting the support you need. If no one comes to mind, pray and ask God to show you who can support you. If you still have no one, please message me and I will personally pray with you. I mean this. 2. Don’t be ashamed of yourself for crying or feeling down. Healing from loss usually doesn’t happen overnight. You will experience a wide range of emotions and feelings, but if you give those feelings to God, in time you will be okay. Know that crying or having bad feelings doesn’t mean you don’t trust God, it just means that He is still making you new. 3. Pray, read the word and journal like a madwoman (or madman) and declare God’s promises daily. Write these on your mirrors, put them on flash cards, hang them up around your room or do whatever you have to do to be reminded constantly of God’s truth concerning you. 4. Don’t jump into anything else to keep yourself distracted or try to open a door that God has closed. A huge mistake that many people make, especially after a relationship ends, is jumping into another one to fill that void. They find another person to consume their time, share their broken heart with and try to find solace there. This is so dangerous, both for them and the person whose heart they are involving. After loss, healing must take place. If we pursue another relationship before God’s appointed time, we risk further damaging ourselves and hurting another person. Love protects and it preserves. Do not bring someone else into your life until you are emotionally available and God leads you to do so. Lastly, don’t try to open a door that God closed even if you don’t understand why He did it. Obedience doesn’t require explanations or understanding. In His time, He will reveal things to you and you will be thankful that you obeyed Him. Obedience wins. There will be days that you wake up with the memory of what is now gone. It can consume your thoughts, but if you can daily submit your thoughts and your mind to God, you can keep those thoughts at bay and keep your mind stayed on Him. Renew your mind daily with the knowledge of Christ. More than anything else, keep in mind that God’s love for you is unending. His goal is not to hurt you; it is to save you. Your happiness matters to Him but your salvation and growth matter more. 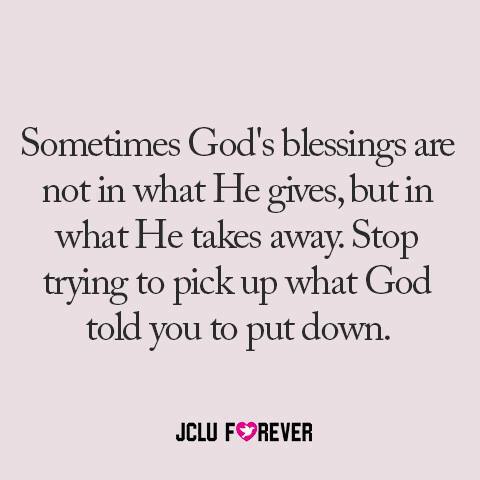 And just like Job, God may take something away, but He will always make it worth your while. This doesn’t always mean that you get a better home or job, but it may just mean that He connects with you deeper. God didn’t give me a new relationship, but I have been brought into a deeper place with Him. He gave me more of what I needed to grow and if loss is what it took to get here, I’d go through it all again. I pray that this blesses you! As someone who has gone through this multiple times, this is extremely pertinent and valuable information. Thank you for posting this. Blessings! Praise God. I’m so glad that someone else who has experienced this can too say that this will be helpful. Thanks for reading, Pastor Willoughby! Blessings to you. May God continue to bless you!i needed to hear this..Thank you so much. I’m so glad that this could help you. God is good! Amen amen amen, Through it all I have leaned to trust Him. never have I seen the righteous forsaken or His seed begging bread. I needed to hear this. Thank you! Thank you sooooo much for sharing& being obedient to God- I really needed this! Praise God! I’m so glad it was a blessing to you! This is true. It is only now that i understand that he only one we should hold when we lose a part of our life. Yes. God is the only constant in our life. When we go through difficult times, we can rest assured that we he will be there ready to help us. hello, reading this passage made me feel better. it gave me another way to look at the situation in my loss. Praise God! I’m so glad that it could be a source of comfort for you! Again, I left a reply on the “Welcome” page. Has the lord replaced the relationship that you lost… Has he provided joy for your pain. Hi Nadia. Indeed He has. I am now happily married and am still thankful for all that Christ did for me in this season. Thank you for reading. I have lost my wife of 19 year of marriage. She left me to be with someone else. She didn’t just leave me, she said, “you’re not worthy of me, you don’t deserve me.” Those were the most painful words that I ever heard. It’s been more than a year now, and I am recovering. I have no friends, no job (I was a stay home dad), no car, no money, no family to help me. I live with my 19 y.o. son, who plans to move out to live with his girlfriend in 5 months. What my mind says, and was saying all this time, that I should either try harder to get my life together, or that my life is over, and I should just give up hope. But I trust God. No matter how hard it was, I truly believe that God has something wonderful for me. I already don’t regret the loss, because I have grown closer to God, and I have always wanted to be close to Him, but I couldn’t because my wife was my idol. Now, I have nothing, yet I am blessed more than I’ve ever been in my life, because I have God. I have God. He teaches me, shows me my mistakes, takes care of me, opens Himself to me. I don’t want to go back to my previous life, because walking with God is, beyond comparison, better. Pingback: ﻿Becoming One: Our Love Story – Life. Joy. Beauty. I’d be happy to pray for you, Debbie. Thanks for what u wrote. I have been in sorrow and pain for sometimes now. Trying hard to come out of it completely, but its not easy with me. Am really confused about what happened. Am a born again Christian, l have been praying and expecting God to be blessed with a baby girl. sometime last year l heard a vision and God told me he has brought me to my hitchfree year of fruitfulness and after this dream, after some months God did blessed me, l conceived and had my baby girl. I lost her after she was six weeks old, l prayed and prayed yet she died. Am a kind of confused about what God told me. I am in tears and sorrow now. Doctor said she had a heart disease called congenital heart disease, she has murmur in the heart Doctor said. I watched her strugling with her life in my very arms as she passed on. Now does it mean what l heard was not true or it was not from God? Does it mean such illness can take her away after Gods promised me. Am sorry for all this questions. But am really in tears and pain. I need someone to talk to about it. Thanks for reading and replying. Am grateful.